We stroll the manicured property at the opulent Château du Sureau, admiring the hotel’s setting over looking the mountain town of Oakhurst. Even after soaking up the pampering attention of an overnight here I can’t rectify this with my memories of Oakhurst. Not that many years ago my family lived in a two room shack just a few miles up highway 49, see https://acooksca.com/2009/04/16/a-taste-for-venison/ . Now my husband Bruce and I are sipping champagne by a stone fireplace and watching snow fall outside the windows of this European inspired hotel. Oakhurst was an important town for my family when I was young. My father worked in the lumber mill and we bought our groceries at the general store. A few cheap motels and a clutch of smoke-filled saloons were the amenities for the fishermen and hunters who came through. Bass lake is nearby and the forested hills had deer and black bear. The town’s one stopsign governed the intersection of Highway 41, the route between Fresno and Yosemite Valley, and the gold country road, Highway 49. Oakhurst was never a booming gold town, although in 1850 about $90,000 in gold was taken from the nearby Coarsegold River. Fresno Flats, as it was originally called, was the southern entry point to the gold fields of the Central Sierra. In 1850 alone thousands of immigrants swarmed into Fresno Flats, overwhelming the three Native American tribes that lived in these meadowed hills. Farmers and ranchers took the land to supply food for the forty-niners and the Indians were pushed 6 miles north to form the settlement called Ahwahnee. That’s where our shack of a home was. I remember the remnants of one of these tribes visiting my father in 1960 bringing him gifts of rattle snake and bear skins. By 1886 Oakhurst thrived with lumber mills and a flume was built to carry lumber 63 miles from the Sierra Nevada to the valley town of Madera. Much of the granite that was used to rebuild San Francisco after the 1906 earthquake and fire came from this region. The south gate into Yosemite is just 20 miles up the road and Oakhurst became a drive through for visitors to the park. It was a simple mountain town, with nothing to pause for, until a passionate Austrian cook chose an Oakhurst hillside on which to build her romantic vision. Erna Kubin-Clanin came to California and cooked for 6 years at the Redwood Inn, in the Wawona forest of Yosemite. But in the early 1980’s the forest service began to eject private businesses from the National Forest. In nearby Oakhurst Erna found a sunny hillside blanketed in pines, wildflowers, sage and elderberries much like areas of Provence she knew as a girl. She wanted to replicate Europe’s long tradition of exquisite dining in rural settings. Erna built Elderberry House Restaurant on the hill, furnished it with classical trappings and offered a cuisine to match. Erna tells the story of her “discovery” by a nationally known food critic. In 1984 a gentlemanly dinner guest arrived late for an 8:30 reservation, saying he had become lost. Erna sat him in her gracious dining room and served his dinner. He thanked her for an extraordinary meal and introduced himself as Craig Claiborne. He stayed for three days, cooking with Erna in the kitchen, clearly amazed at finding such technique and quality in a rural town (this was a time before baby lettuce and fresh fish were found in out-of-the-way restaurants). His critique in the New York Times helped forge the trail of sophisticated diners to Oakhurst. But there was still no quality lodging in Oakhurst for Erna’s guests. Taking her romantic vision to the next level, Erna hired a local builder and over the next 6 years they planned and built at castle-hotel near the restaurant. Named after the French word for elderberry, Chateau du Sureau opened in May 1991. Erna designed the interior and collected furnishings and antiques to provide guests the experience of a private lodge in Europe. 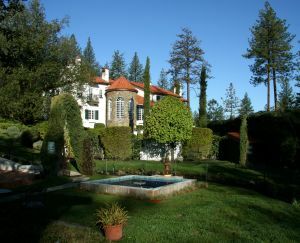 The Château du Sureau is one of nine properties in California with membership in the prestigious Relais & Chateaux group, an international collection of luxury lodging in unique settings. I still think that Oakhurst, a plain town of convenience stores and chain motels, is an unlikely place for an elegant hotel and restaurant. But as so many other visitors on their way to Yosemite each year I am delighted Erna doesn’t agree. 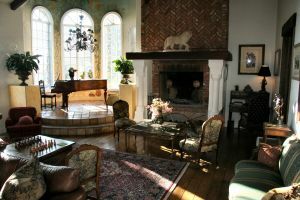 In the summer season and around holidays the Chateau’s 10 rooms are booked months ahead. If you miss out on a room, stay in town and make a dinner reservation for Elderberry House Restaurant. You will enjoy old world pampering and see why Erna has made Oakhurst a destination.